During the week, you’ll find Jessie Randall and Brian Murphy working out of the Soho HQ of their mega-chic accessories brand, Loeffler Randall. 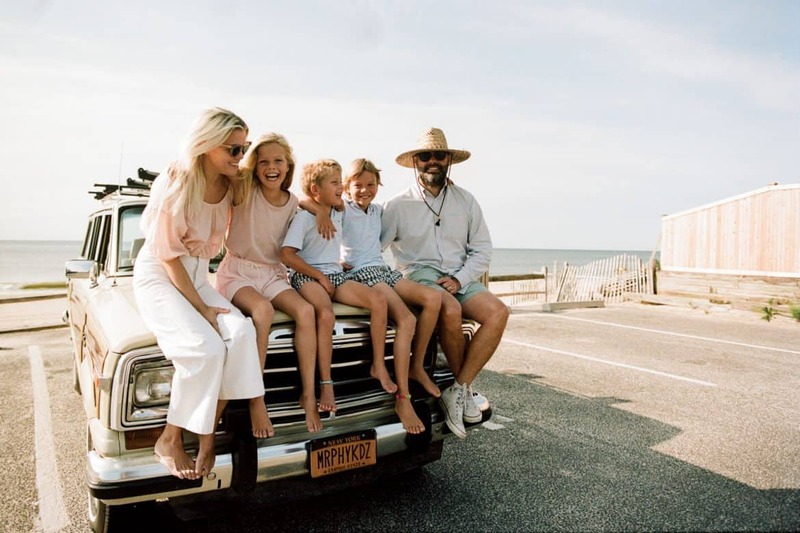 On the weekends, they’re spending QT at home in Bridgehampton with their three kids, Clementine, Casper, and Harry — and, when stars align, occasionally hitting the road in their vintage Wagoneer! Brian Murphy: Five years ago, but we first rented out here in the late ’90s. I worked at a super cool, really advanced ad agency, and some of my colleagues there rented a house on Ocean Road in Bridgehampton. One summer, two of them said, “Hey, we’ve got one room available every other weekend if you want it.” Jessie and I had just started dating—we met at work. Randall: Clementine and Casper are 11, and Harry is 7. When the twins were little, they were really active. The only way we could really keep them engaged was by swimming. We took them to pools in the city, but ultimately the decision-making process to buy our house in Bridgehampton happened pretty fast. We drove out here a couple of times, looking for a place to rent, but we found a perfect place for sale that was already renovated. It almost looked like we had designed it ourselves. Randall: Our house almost looks like the pool house of someone else’s house — it’s very charming. I wanted it to be really beachy, so I have a really tight color palette in there — all neutrals, using natural leather, wicker, and straw. It’s a retreat from our crazy, hectic lives. It’s located close to town in Bridgehampton, and what we really loved is that we can easily walk to places. Randall: In the summer, our kids go to Hayground, an amazing camp down the road that we love. When they get home from camp, we just throw them in the pool, and they hang out in the pool, and then we don’t do too much. We try to avoid the traffic at all costs, so maybe we’ll have friends over on Saturday mornings. On Saturdays and Sundays, our twins do a junior lifeguarding program in East Hampton, which is amazing. They started when they were 9 — they had to try out for it. Basically, they’re getting all the training they would need to ultimately become lifeguards. They teach them all about rip currents, lifesaving techniques — it’s like Baywatch for kids. Then I’ll take Harry to Main Beach, and we’ll sit out on the tables and play board games. He likes to go to the café 47 times. In the afternoon, I’ll pick up food from Loaves & Fishes, and we’ll grill and hang by the pool with friends. At night, I try to get a babysitter for the kids, and the adults will go out to dinner somewhere. You’ve got a pretty great ride. Randall: Brian likes to have a project; he’s always threatening to buy something like a motorboat. Murphy: Even though I have no experience with boats at all. I grew up in Chicago! Randall: He was searching for this Wagoneer for forever and ever, and he kept sending me pictures. I was like, “Brian, please stop,” and then all of a sudden he said, “I did it.” He bought it sight unseen off of someone from the Internet, and he had to pay to ship it from upstate New York. We used to park our car at a great place on Mercer Street in Soho, and one of the guys who worked at the garage called and said, “Your new car is here.” Brian turned it on, drove it down the block, took a right…and the car completely died. Murphy: I was so embarrassed. There were hundreds of people around. I think I managed to get it pulled over to the side of the road in front of Intermix, and then I had it towed back to the guy I bought it from. Then, he called and said, “I promise, I really fixed it. But this car is not going to like highways.” So we had it shipped out to the Hamptons. We can usually keep it alive for two months out of the year. Randall: It also doesn’t back up, so I have to find a parking space that lets me drive straight through. [Laughs] Still, it’s just a fun beach car; the kids love it. Murphy: It only gets one radio station — 95.3 FM, Long Island’s classic rock. It’s amazing! Randall: And the seats are so wide that it feels like you’re like sitting on a giant couch!